Shake the house! These aren't just noisemakers, they're a rumble of inspiration fueled by fans. 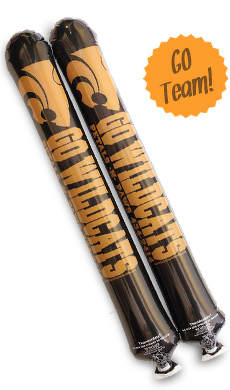 Make some noise in the crowd at an inexpensive price with original thunderstix. Let yourself and others be heard in the crowd making thunderous noise banging these inflatable thunder sticks together. Let your voice be heard handing out these thunderstix. With your company or sporting team logo imprinted on these high quality noisemakers and the crowd banging them together, your name will be the first thing people notice. People are naturally attracted to loud noises and bright colors. Why not print your company name or organization logo on these flashy loud thunder sticks. Cheer on the team or pep up the crowd at your next fund raiser. Looking to save some money buying in bulk? If you’re a company or organization looking to promote in volume save some money and purchase your thunderstix at wholesale prices. Make some thunder among the crowd at the next hockey game or your next hockey themed event. Inflatable thundersticks in the shape hockey sticks make the perfect promo item that will promote your name in a big way. Shaped like hockey sticks, these cheering sticks are white in color, perfect for hockey and then you can imprint them with your team name and logo in one of 14 color inks.